In Russian the “Aprelskiye Tezisy”, the April Theses formed a programme developed by Lenin during the 1917 Russian Revolution. In these Lenin called for Soviet control of the state. When published the theses contributed to the July Days rising and to the subsequent coup d’etat of October 1917, bringing the Bolsheviks to power. 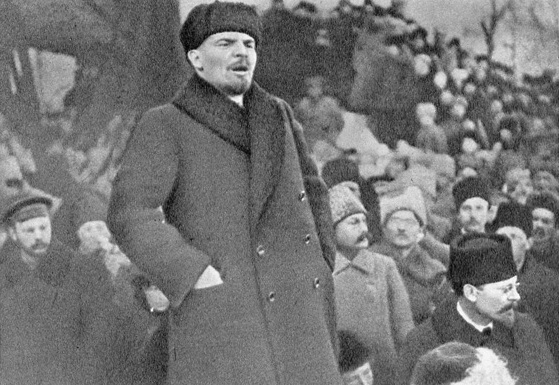 Condemns the Provisional Government as bourgeois and urges “no support” for it, as “the utter falsity of all its promises should be made clear.” He condemns World War I as a “predatory imperialist war” and the “revolutionary defensism” of foreign social democrat parties, calling for revolutionary defeatism. Calls for a new “revolutionary International, an International against the social-chauvinists and against the ‘Center. '” This later became the Comintern (Third International) which was formed in 1919.